Upon getting ready to load up this family, I am not sure why, but I was just not “feelin'” it. 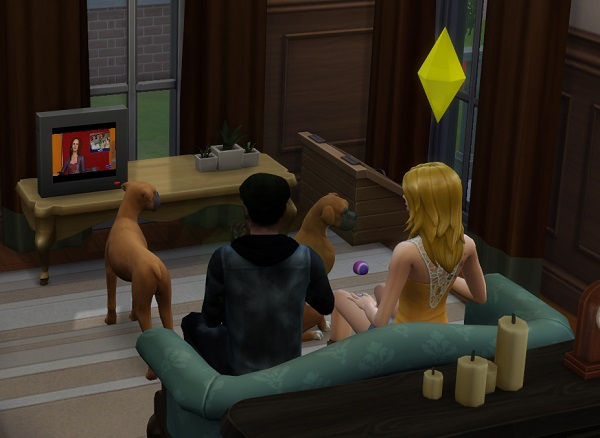 In an attempt to make it more “interesting”.. the first thing I did was take one of EA’s officially-made dog households and merge it into this one. So, Welcome Xena and Ginger. 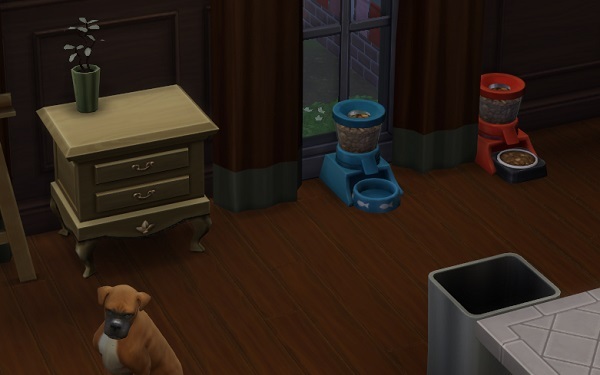 Also, I did virtually nothing to the house, since they couldn’t really afford it.. and I have to say, I was dreading playing through a whole week in this tiny house with two big dogs. I expected a bit of a madhouse, and I wasn’t wrong.. but again, I’m getting ahead of myself. 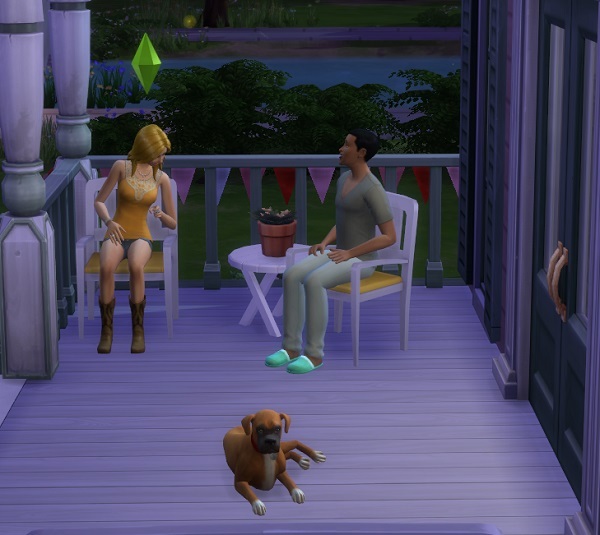 The two dogs, Xena and Ginger (both girls) were waiting at the front doorstep when I loaded up this family. (And for some reason, the entire week, I forgot to take down the Love Day decor that was up when I loaded the house.. I fixed it before I moved to the next family, though. Ollie.. meet Babs. Babs.. likewise. They seem to hit it off rather easily, and I prepare myself for a simple week. .. 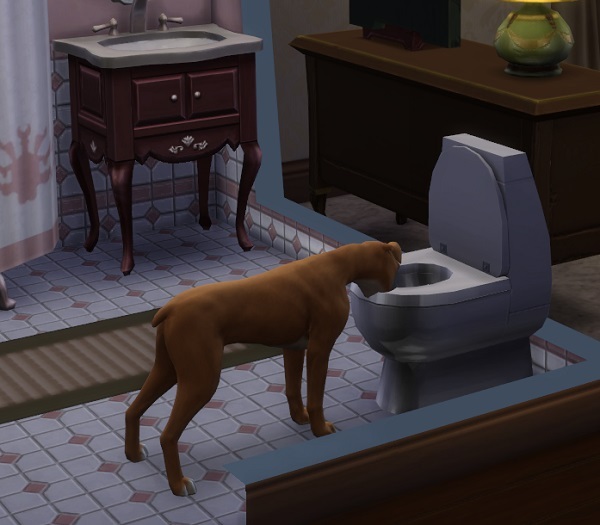 Drinking from the toilet… Making messes in the house.. you name it, she got into it. Ollie and Babs continued to get along well, and every once in a while, Xena gave me a little time to try to get them together. 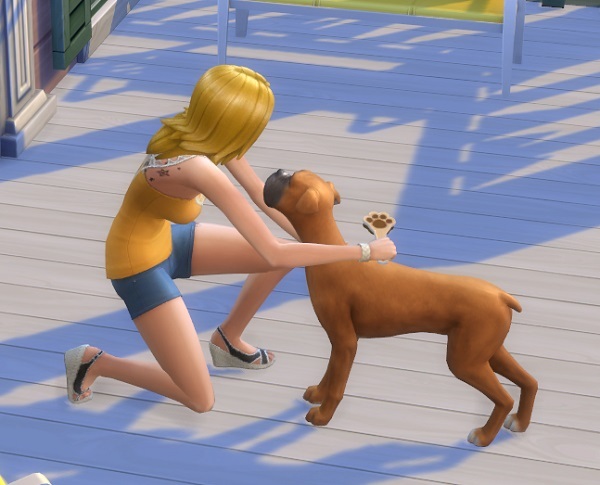 Ginger, on the other hand, was loyal and well behaved .. so at least I didn’t have to worry about her misbehaving, too. One evening, Babs finally decides to make her move. .. Under the watchful eye of Ollie’s new shadow, Ginger. 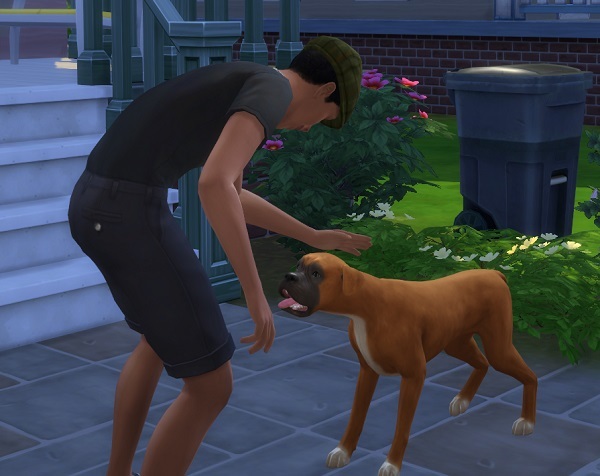 … and the first kiss. Things were finally progressing. .. 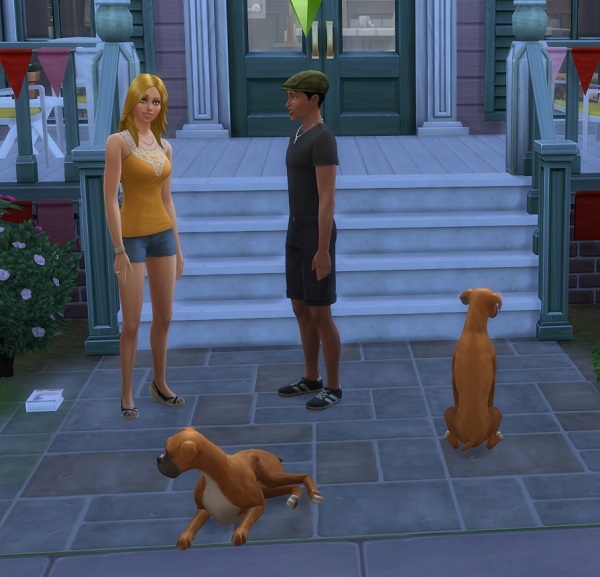 But then, the dogs needed my attention again, and Babs and Ollie’s new relationship got sidelined. Xena really seemed to have taken to Babs, however, and Babs was finally able to get a better handle on Xena’s wild ways. 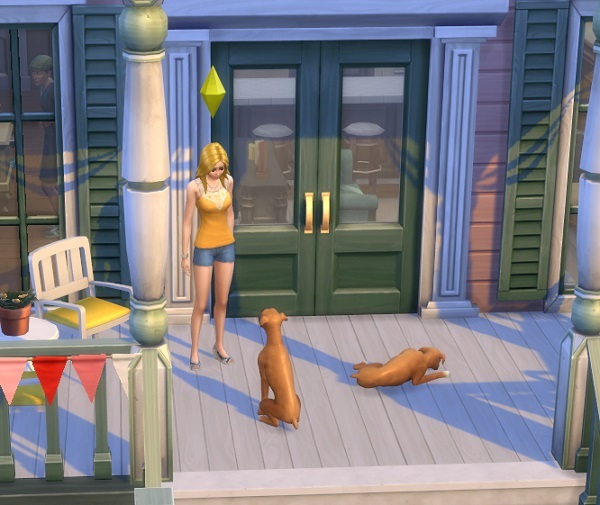 .. Xena seemed to soak up the training.. while Ginger simply moped around the house while Ollie was off at work. 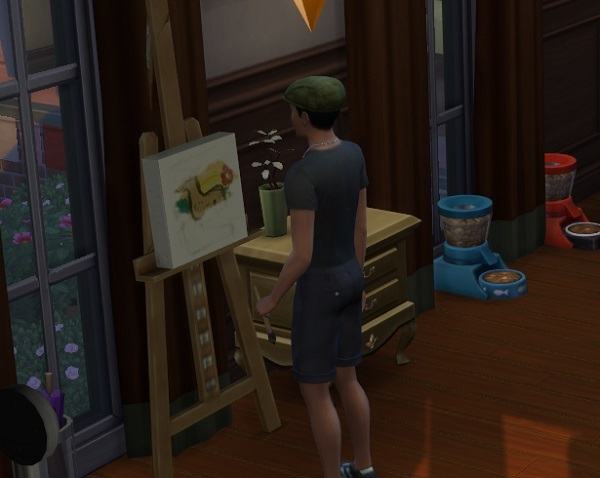 When Ollie wasn’t at work.. he was usually found painting.. or playing with Ginger. When was I ever going to find time out for Babs and Ollie? 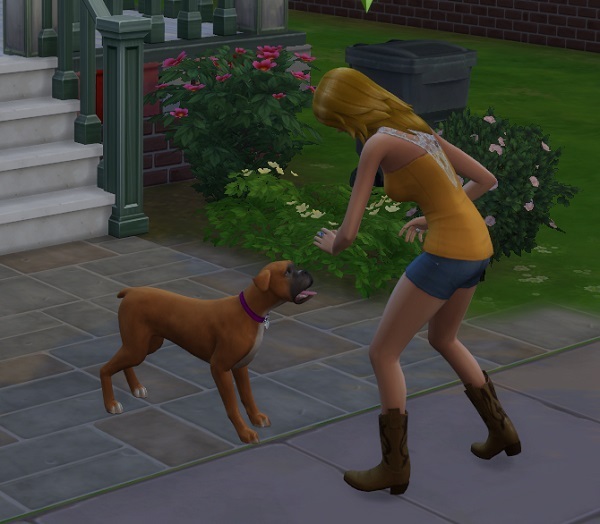 Cassidy Purdue (Ollie’s sister) stopped by for a visit, and Babs and her quickly started up a friendship. .. Until Xena took all my attention again. 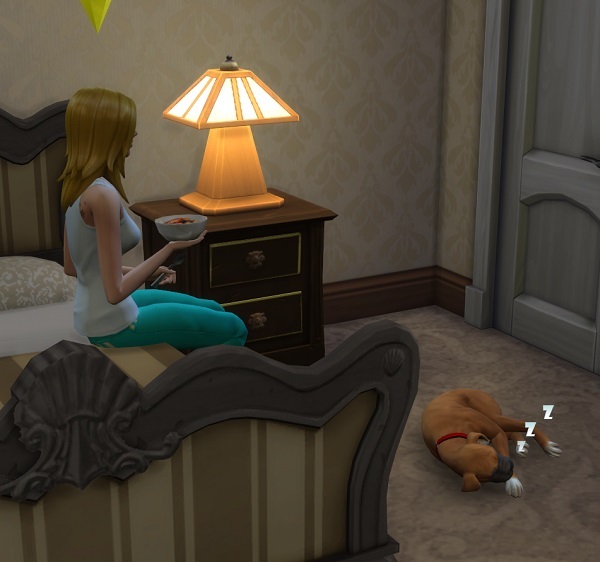 Bad dog! All that playing in the trash meant Xena needed baths nearly every day. 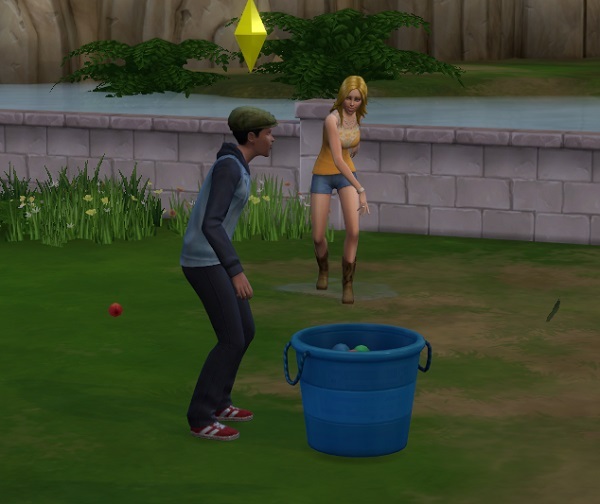 … well at least she’s not playing in the puddle. I guess sleeping in it is better? 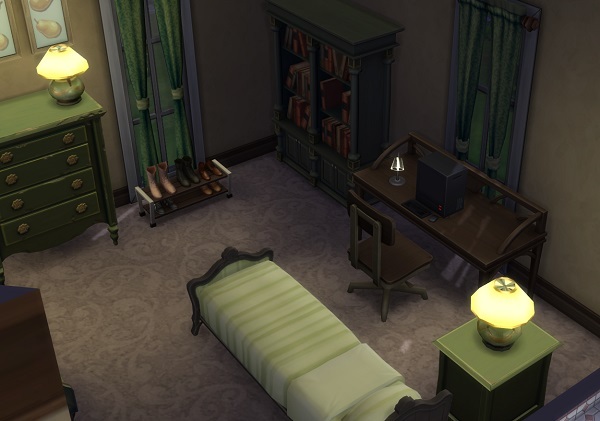 With my custom holiday I named “Summerfest” incoming (I believe I called it “Memorial Day” last year, but this seemed like a better title), I bought them a computer and desk so they could order fireworks. 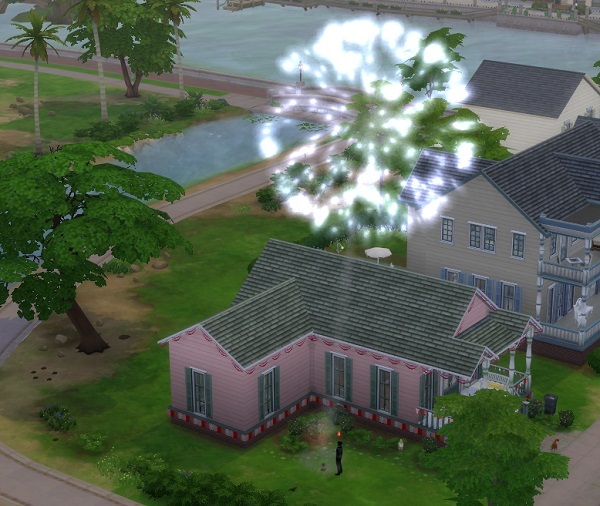 And grimaced at the chunk it took out of their savings towards a bigger house. 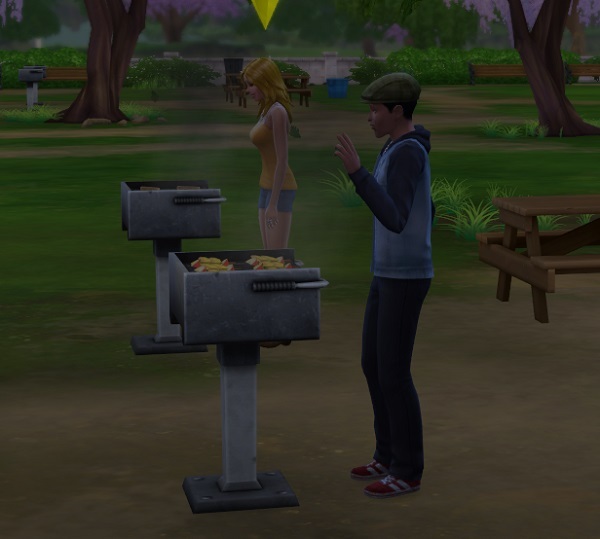 For the BarBQue part of the holiday, the grills at the local “park” worked just fine, and they both made something tasty… Grilled Fruit for Ollie, and Sausage and Peppers (which always sounds so yummy) for Babs. 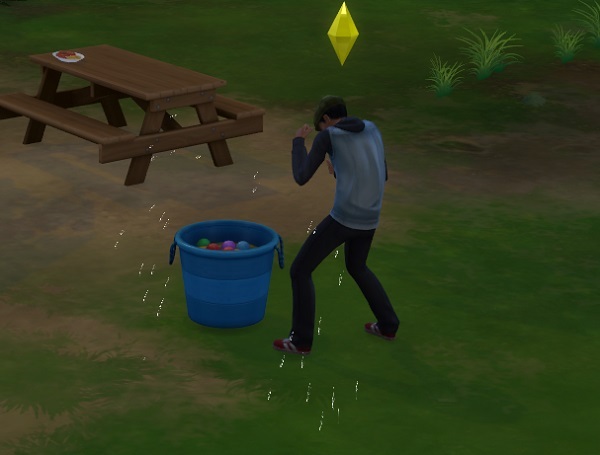 After lunch, the two got into a rousing game of water balloons. .. Although Babs’ clumsy nature meant she only hit Ollie just that once. .. 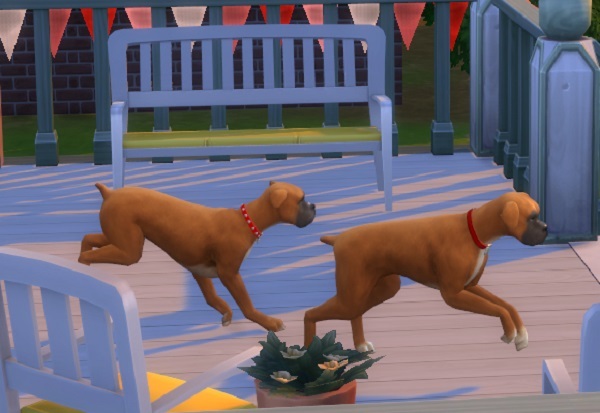 The dogs didn’t quite know what to think.. but I love the way they look when you zoom out! ..The little family really seemed to be coming together. .. Even if much of my time was still centered around watching to make sure Xena was behaving. ..Finally, I take some time out for Ollie and Babs. “Playtime? !” … no, Xena.. they’re busy. 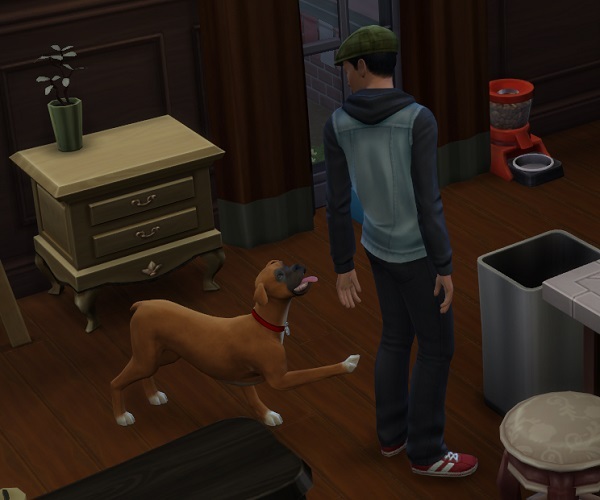 … Maybe it was the dog that caused him to say no? Hm.. no worries, I’ll just try again the next day. 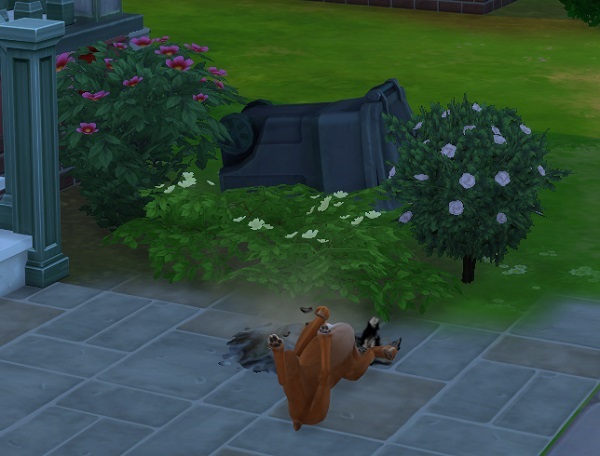 Ginger decides to chase off the local vampiress. Thankfully. I couldn’t deal with more chaos in this family. …Xena, however, was finally calming down. 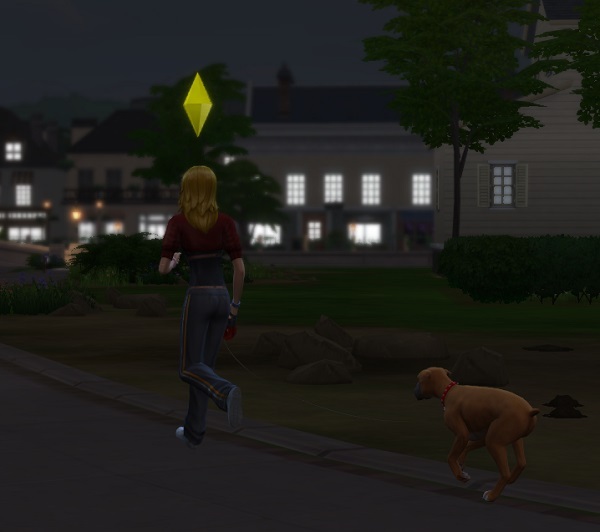 Perhaps her nightly jogs with Babs were helping curb her appetite for activity. 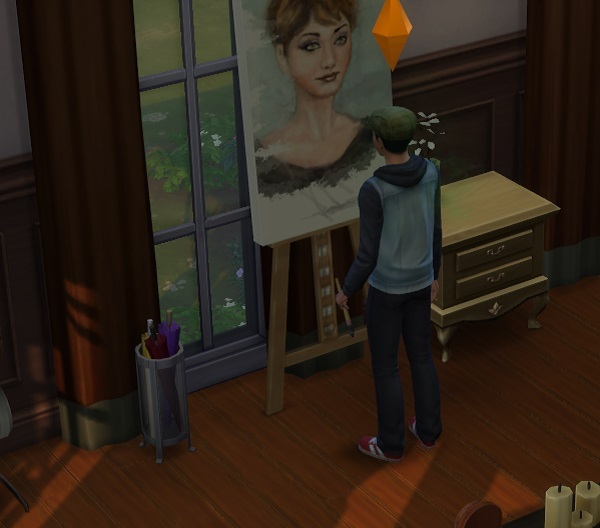 Ollie, again, gets lost in his painting. .. But Babs is determined. “No?! AGAIN? !” .. What is Babs doing wrong?? 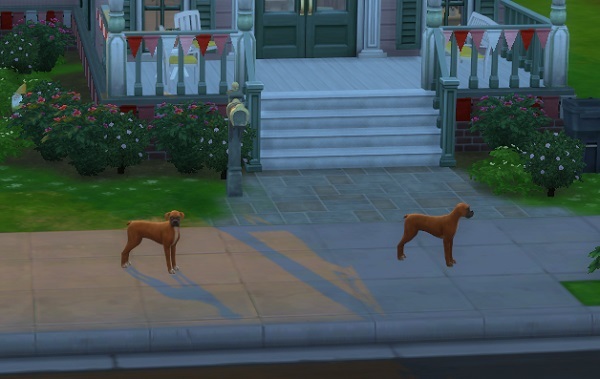 And now, the dogs are fighting. Ollie breaks up the argument, then heads exhaustedly to bed. 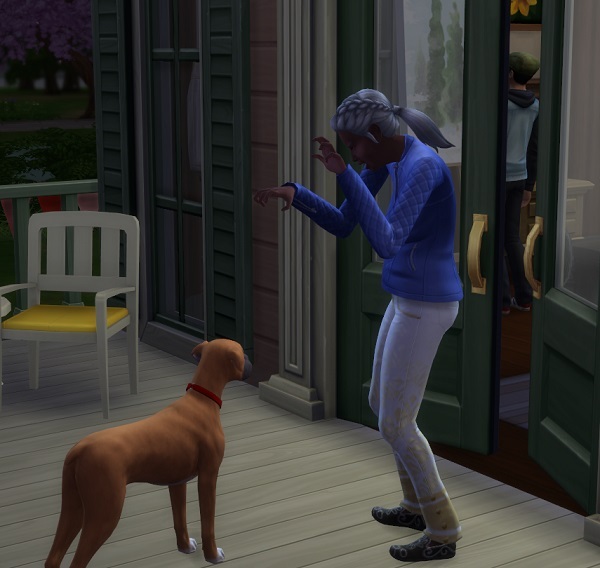 .. Luckily, neither dog was hurt, but Babs is surely wondering if the strife between Ollie and herself is causing the dogs to act aggressively towards each other. 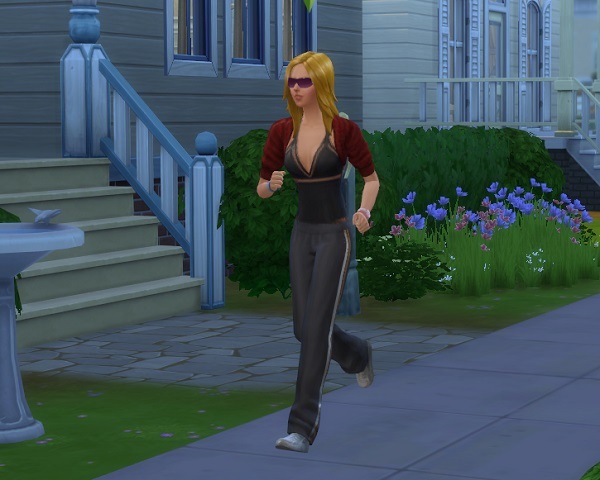 Babs takes a long jog by herself, since Xena seems to be busy. 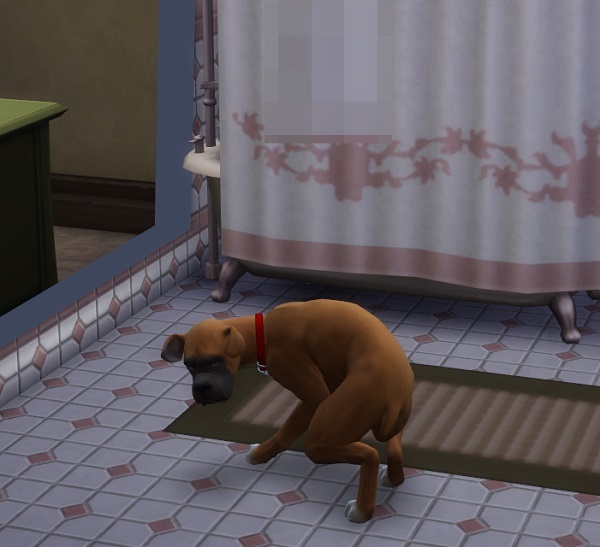 .. And we finally figure out what’s wrong with Ginger. She’s terrified of the bathtub. 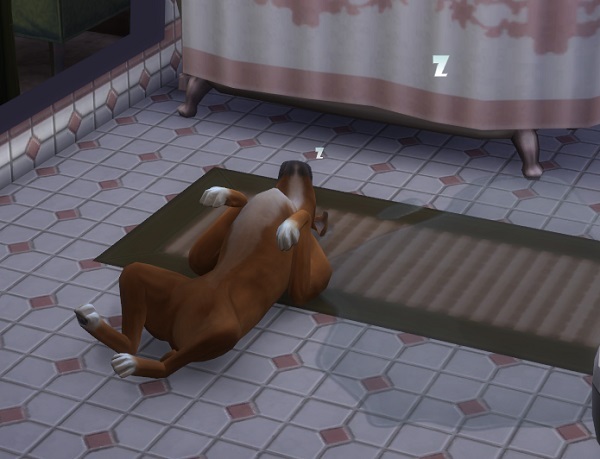 Since it seems like someone is always in the bath, it’s no wonder she’s stressed out constantly. At least the dogs seem to have made up.. and Ollie and Babs watch them frolic together again with relief. … Finally!! Third try is the charm! 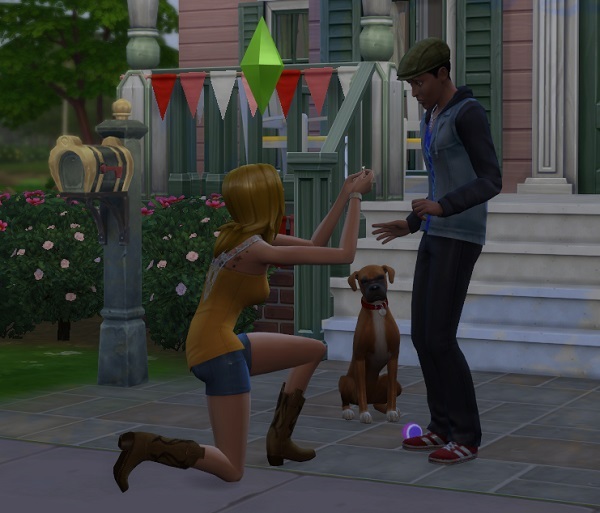 I don’t remember the last time two sims were harder to get together. The next day.. I set another custom holiday, because summer is just needing a second holiday. I made one that involved streaking, camp fires, a party spirit, and telling stories. Sounded like a good end of summer holiday to me. .. Then I realize .. that the entire neighborhood is doing it. ?!?! .. This photo was the best, though. It’s not really streaking, is it, if you have to stop to check your phone. Doesn’t streaking, by definition, mean you’re supposed to be running fast? *facepalm* Never again. No more streaking holidays. I learned my lesson! So.. 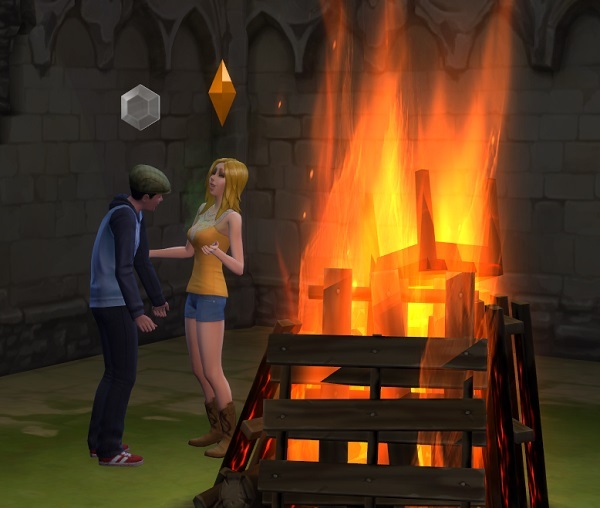 Fully clothed again, I send Babs and Ollie to the Ancient Ruins in Windenburg for a romantic bonfire. 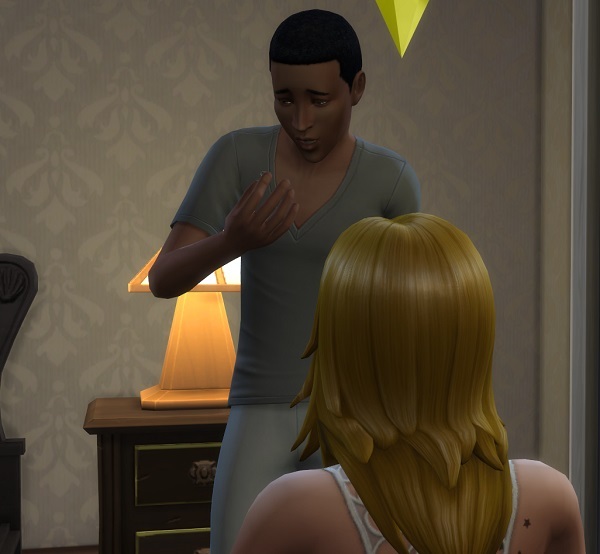 While they’re there, I have them say their vows in a simple ceremony. 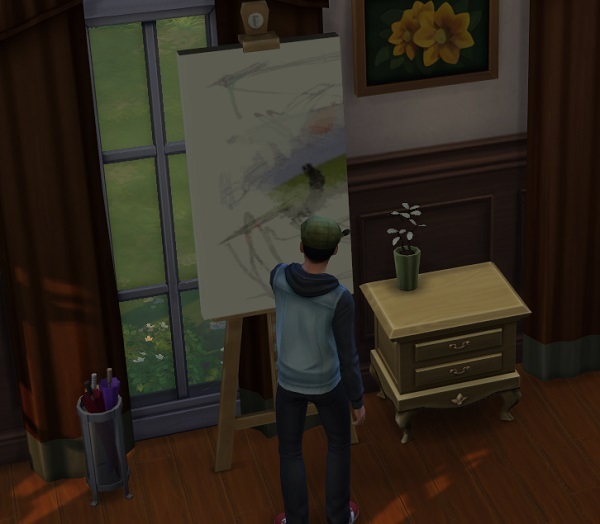 Ollie decides to finish the night off with another painting. While Babs, wisely… heads to bed. What a week. 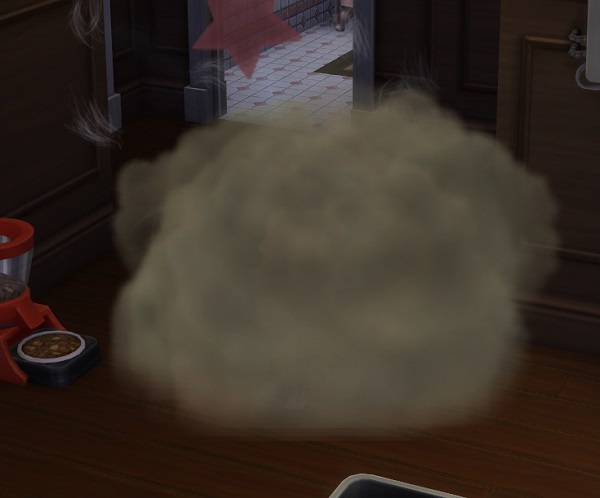 Never let it be said that sims can’t surprise you. Plans can ALWAYS go astray! Wow! That was exciting! Seasons really changes the game, doesn’t it? 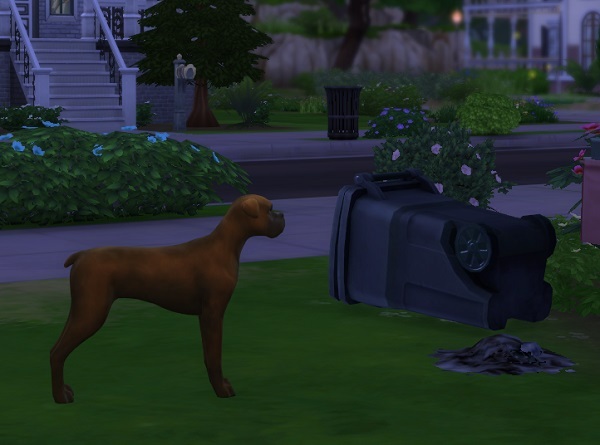 Quite frankly, that was the strangest sim-week I’ve ever had.. and I’ve been playing since the original Sims. Seasons changes things.. but definitely an unpredictable week. 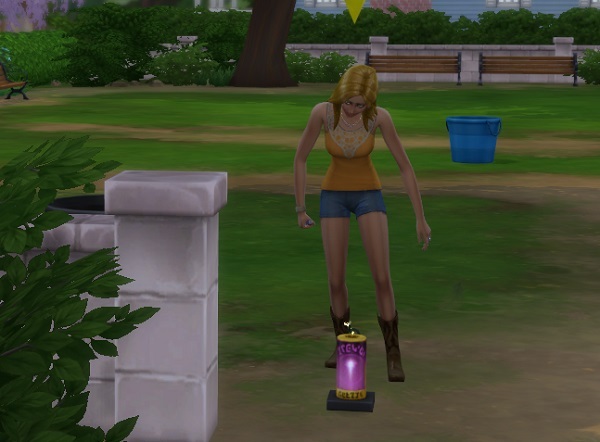 I figured I could get my sims to do whatever I wanted.. and they just weren’t cooperating this week. LOL. They were very silly! It might be Babs! She seems a little funny in other stories I’ve read, too. 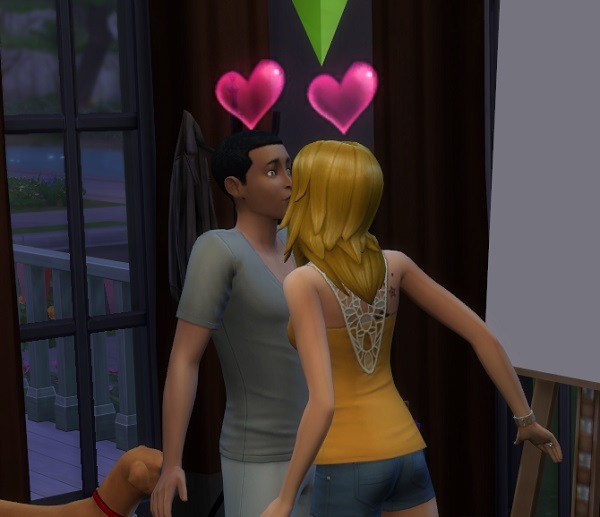 I played her before and things went completely normally.. even had her with Ollie (why I keep choosing that pair is beyond me).. and things were fine. Just a weird week. It kept me on my toes, that’s for sure.